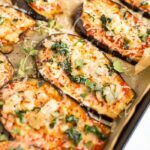 A low carb eggplant pizza recipe that uses sliced eggplant instead of a carb-heavy breaded crust. Tons of flavor and super simple to assemble, this recipe is gluten-free, vegetarian and vegan-friendly. Does anyone else feel like eggplant is a forgotten veggie? I mean, besides the eggplant emoji, when is the last time you thought about eggplant? Or purchased eggplant? Or maybe you’ve never even eaten it before?! I remember the first time I tried eggplant… it was post-college and layered with cheese and basil and pan-fried to perfection. I loved it, but if I’m being honest, eggplant isn’t a veggie I buy on the regular. But lately, Isaac and I have been low-key obsessed with this eggplant pizza, so I see a lot more eggplant in my near future. Eggplant is a great “vehicle” for flavor. What do I mean by this? It’s pretty mild on its own so it pairs really well with complex flavors, making it a great base for a recipe! I had the idea of creating a pizza using eggplant as the crust one weekend when pizza was on my brain. 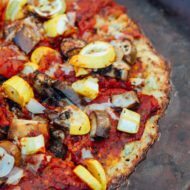 I love that this pizza is easily made low carb by using eggplant and how simple this pizza was to create (aka much easier than putting together a cauliflower crust!). It’s definitely more of a fork and knife pizza, but trust me when I say that it’s really delicious and just like regular pizza. And you can top it with anything you desire! I made this veggie version to share, but I’ve also made a meat version with chicken sausage from our local farmers market and it was phenomenal. If you want a little more protein, follow the instructions for how to add ground meat (or veggie crumbles) to the recipe. What are the benefits of eating eggplant? Eggplants are very nutrient dense – meaning they pack a lot of vitamins and minerals in without a ton of calories. They’re low in carbs, but high in fiber, folate, potassium and manganese along with other vitamins and minerals. One important thing to note: eggplant, just like tomatoes, potatoes, peppers and tomatillos, are in the nightshade family. Nightshades are typically safe to consume but they do contain alkaloids so if you’re someone who struggles with autoimmune conditions, IBS or other food sensitives consuming nightshades might contribute to your condition. Learn more about nightshades here. Is eggplant good for losing weight? 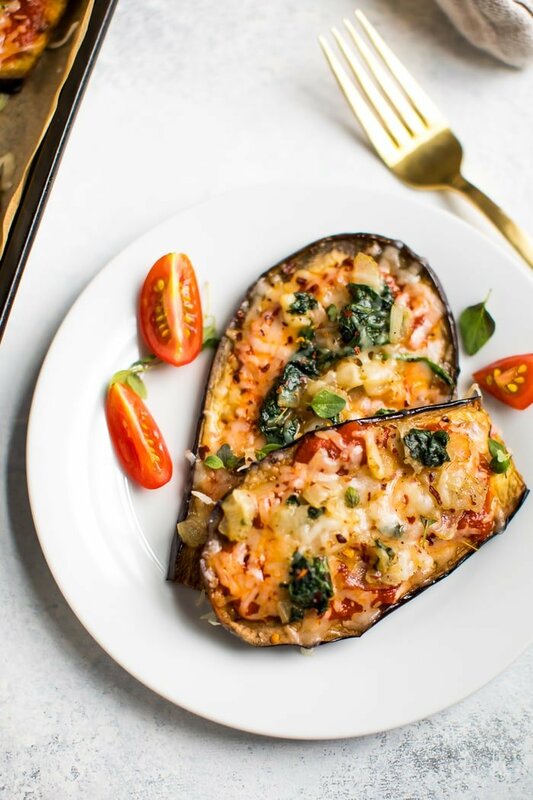 Because of eggplant’s texture, flavor and ability to replace higher calorie foods, eggplants are great to incorporate when trying to lose weight – and this recipe is the perfect example! 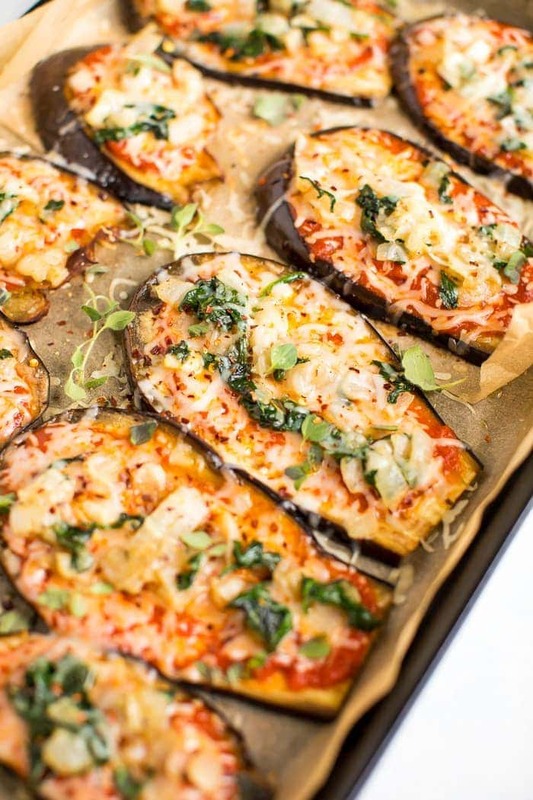 Instead of making or ordering pizza with a doughy crust loaded with calories, you can easily make this eggplant pizza that is packed with fiber, vitamins, and minerals! All the pizza flavor is still there — you’re just replacing the crust with something a bit healthier. There is a myth that raw eggplant is poisonous. This isn’t true, however, the leaves and flowers of the plant can be toxic. And like I mentioned above, plants in the nightshade family, all contain alkaloids. One alkaloid present in eggplant is called solanine and it can be poisonous when consumed in extremely large quantities. So yes, eggplant is okay to consume raw, but at the end of the day it tastes much better cooked – plus there are so many ways to cook it! You can eat the skin and the small seeds, just make sure you cut off the green stem on the top. You can cut it into strips (lengthwise) or into rounds (widthwise). Bake it, roast it, grill it, pan-fry it… so many options. As for peeling eggplant, you certainly don’t have to peel them – it’s really your choice. The skin is completely edible, but sometimes with larger eggplants, the skin can be a little tough and you may want to consider peeling. 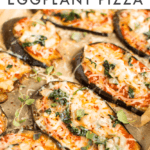 For this low carb eggplant pizza recipe I didn’t find the skin to be too tough, but if you’re using a large eggplant and don’t want to deal with biting through the tough skin, go ahead and peel your eggplant before using it in this recipe. If you try this eggplant pizza recipe be sure to leave a comment and star rating letting me know how it turned out. Your feedback is so helpful for me and other EBF readers who are planning to try the recipe! 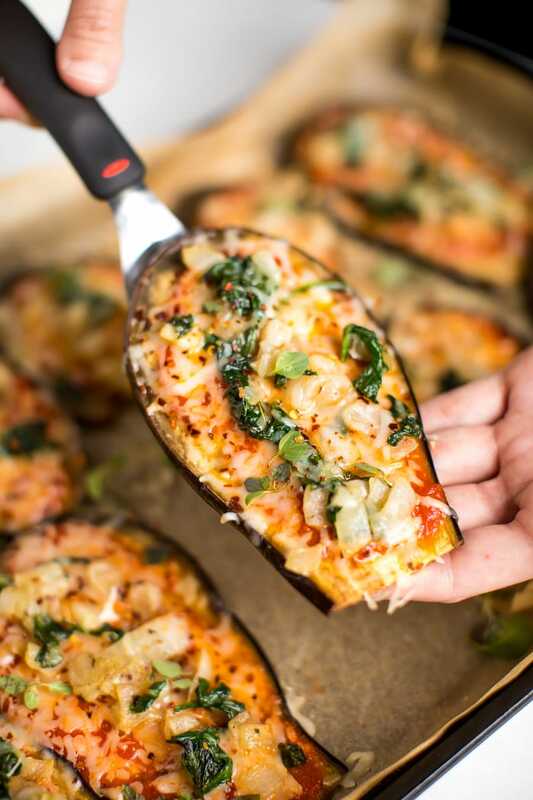 A low carb eggplant pizza recipe that uses sliced eggplant as the crust instead of a carb-heavy breaded crust. Tons of flavor and super simple to assemble, this recipe is vegetarian and vegan-friendly. Slice the eggplant lengthwise, about 1/4-1/3 inches thick. Brush or rub a little olive oil on each side of the eggplant slices and place on a baking sheet lined with parchment paper or a baking stone. Sprinkle with salt and pepper. Place in oven for 7-10 minutes, or until eggplant is hot and starting to cook down. 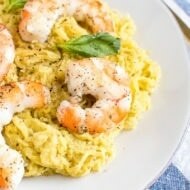 Meanwhile grab a skillet, add 1/2 Tablespoon olive oil and sauté the garlic and onion until soft (about 3-4 minutes). Season with salt and pepper. Add pizza sauce and spinach to the skillet and cook for 1-2 additional minutes until mixture is warm and spinach has wilted. Remove the eggplant slices from the oven, top each with the onion and spinach mixture. Sprinkle with cheese and chopped oregano. Place in the oven for approximately 5 minutes, or until the cheese has melted. Serve immediately with more fresh oregano and crushed red pepper. For the pizza sauce you can make your own using my recipe or use store-bought. My favorite store-bought option is Rao’s Homemade. If you’d like to add more protein to this dish, simply add about 8 oz of ground chicken sausage or veggie sausage to the skillet with the garlic and onion. Sauté until sausage is thoroughly cooked and then add your pizza sauce and spinach. Looking for more eggplant recipes? Try baba ghanoush, my slow cooker ratatouille or this slow cooker coconut curry with eggplant. 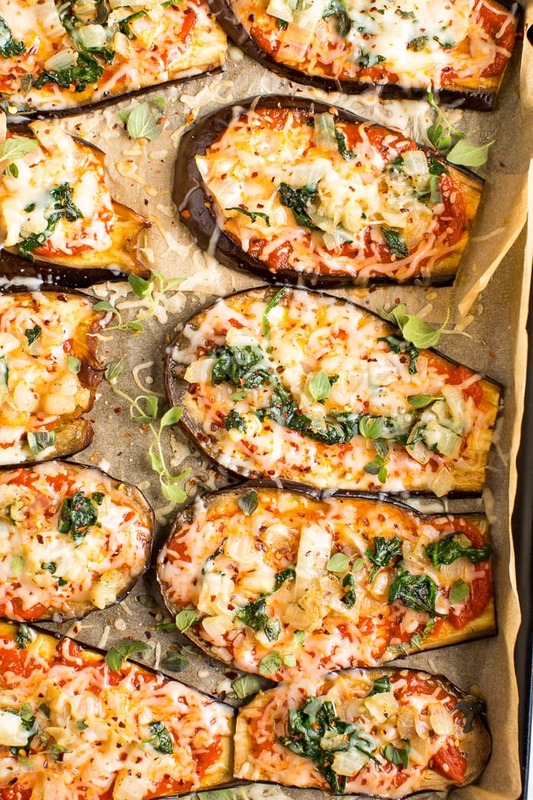 Do you have any other amazing recipes that you love using eggplant? Leave them in the comment section below. 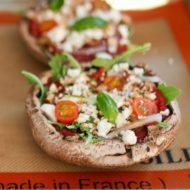 I love eggplant so I can only imagine and how delicious it would taste with this pizza inspired recipe! How do you slice eggplant lengthwise that thin? Mandoline? Really steady hands? Just steady hands! I think slicing with a mandoline would make them a little too thin. This was delicious! I’ve never had eggplant before, but I was looking for gluten free recipes and decided to try this one. I did the vegan version, but adding sausage would be delicious, too. It has a lot of great flavor and it’s simple to make. I had all of the prep dishes and utensils washed before it finished baking. Hi, just looking over your recipes and enlightening information. As a gluten free and now turned grain free individual, I am thankful to see your scrumptious recipes and look forward to trying them. Looks amazing!! I’m wondering if these can be made ahead of time and left in the fridge or will the eggplant become mushy? I think it might become mushy. I think it’s best eaten immediately.